Objective To study how composite outcomes, which have combined several components into a single measure, are defined, reported, and interpreted. Design Systematic review of parallel group randomised clinical trials published in 2008 reporting a binary composite outcome. Two independent observers extracted the data using a standardised data sheet, and two other observers, blinded to the results, selected the most important component. Results Of 40 included trials, 29 (73%) were about cardiovascular topics and 24 (60%) were entirely or partly industry funded. Composite outcomes had a median of three components (range 2–9). Death or cardiovascular death was the most important component in 33 trials (83%). Only one trial provided a good rationale for the choice of components. We judged that the components were not of similar importance in 28 trials (70%); in 20 of these, death was combined with hospital admission. Other major problems were change in the definition of the composite outcome between the abstract, methods, and results sections (13 trials); missing, ambiguous, or uninterpretable data (9 trials); and post hoc construction of composite outcomes (4 trials). Only 24 trials (60%) provided reliable estimates for both the composite and its components, and only six trials (15%) had components of similar, or possibly similar, clinical importance and provided reliable estimates. In 11 of 16 trials with a statistically significant composite, the abstract conclusion falsely implied that the effect applied also to the most important component. Conclusions The use of composite outcomes in trials is problematic. Components are often unreasonably combined, inconsistently defined, and inadequately reported. These problems will leave many readers confused, often with an exaggerated perception of how well interventions work. Unfortunately, composite outcomes can be misleading. This is especially true when treatment effects vary across components with very different clinical importance.7 For example, suppose a drug leads to a large reduction in a composite outcome of “death or chest pain.” This finding could mean that the drug resulted in fewer deaths and less chest pain. But it is also possible that the composite was driven entirely by a reduction in chest pain with no change, or even an increase, in death. Studies show that treatment effects often vary, and typically, the effect is smallest for the most important component and biggest for the less important components.3 5 8 Unless authors clearly present data for all components and take care in how they discuss composite findings, it is easy for readers to assume mistakenly that the treatment effect applies to all components. In this study, we systematically examined how composite outcomes were used and how well they were reported in recent randomised trials. We performed a systematic review of parallel group randomised clinical trials published in 2008 that had a primary composite outcome. We excluded studies where the composite was a secondary outcome measure and studies with more than two arms. The abstracts were reviewed by one person (GC), and potentially eligible articles were retrieved in full and assessed independently by two coders (GC and HB). Disagreements were resolved by discussion, and for ambiguous cases the other authors were involved. The two coders used a standard form to extract data independently and collected data on journals, clinical area, composite outcome and its components, and source of funding. One composite outcome was included per article. When more than one such outcome was reported in an article, we used a hierarchical selection process of (a) authors’ explicit declaration of primacy, (b) the composite outcome used to calculate the sample size, (c) authors’ attribution of importance to the composite outcome in their description of the results, or (d) the composite outcome that appeared first in the methods section. Two pairs of independent observers used standardised protocols to assess the definition and quality of reporting of the composite outcomes. Most judgments involved assessments of facts (such as whether the number of components making up the composite changed within the paper). Here, disagreement was almost entirely due to oversight, not a difference in opinion. For the few subjective judgments, we created simple and explicit rules to objectify the process as much as possible. For example, we judged the conclusion of abstracts as falsely suggesting that an effect on the composite also applied to the most important component (when it did not) if all components were listed using “and” or if the composite was named as a class of events. Our rules are provided when we present results. Also, we provide examples to allow readers to decide for themselves whether our judgments were reasonable. We resolved discrepancies involving facts and disagreements by discussion. Composite definition Two observers (PCG, and LS or SW) independently and blinded to the results selected the most important component of each composite outcome, taking into account the hierarchy for analysing composite outcomes proposed by Lubsen et al,9 and always choosing death (or disease specific death) if such a component had been used. The observers also rated the gradient of importance for components, and looked for any discussion of the rationale for the composite. Reporting of composite We assessed the consistency of the components of the composite between the abstract, methods, and results; determined whether data were reported for all components (that is, so that they could be used in a meta-analysis); judged whether the components were of similar importance; and evaluated whether the conclusion presented in the abstract or the discussion section suggested that the intervention was effective for all the components of the composite outcome rather than just for the composite. Table 1⇓ describes the characteristics of the 40 included trials,w4–w43 which together randomised 110 080 patients, with a median sample size of 1486 (interquartile range 213–4460). The two most common journals of publication were the New England Journal of Medicine (n=6) and JAMA (n=4); 29 trials (73%) were on cardiovascular topics. In 24 reports (60%) it was declared that the trials were totally (n=16) or partially (n=8) industry funded, seven trials did not receive industry support, and for nine trials the funding was not clear. The composite outcomes had a median of three components (range 2–9). The most important component, selected by us, was death or cardiovascular death in 33 trials (83%), clinical events (such as incontinence symptoms, respiratory distress, phlebitis, or arrhythmia) in six trials (15%), and hospital admission in one trial (3%) (table 2⇓). In the remaining 28 trials (70%), the components were not of similar importance: 20 trials had combined death with hospital admission (or procedures that required hospital admission, such as revascularisation), and eight trials had other problemsw5 w6 w16 w19 w22 w25 w32 w33 (such as combining death and silent myocardial infarctions,w22 combining death with new exertional angina and transient ischaemic attack,w16 or combining death with a doubling of serum creatinine concentration from baselinew33). In four trials (10%), the trial authors explicitly stated that they created the composite post hoc.w22 w25–w27 In three cases, the prespecified composite was not statistically significant, but the new, post hoc composite was, suggesting cherry picking (see examples in box). Our comment—The abstract made no mention of the prespecified composite. The additional composite was reported, but its post hoc nature was not mentioned. Of note, the prespecified composite was not statistically significant (P=0.68), but the post hoc composite was (P=0.008). Our comment—Change in the number of components (from 8 in methods section to 11 in results section) is a major inconsistency. In 13 reports (33%), the definition of the composite outcome changed between the abstract, methods, and results sections. For eight trials,w12 w14 w17–w22 the reporting problem was minor, involving inconsistent use of modifiers—for example, whether a myocardial infarctionw12 w17 w18 w20 or a strokew22 was lethal, whether deaths referred to those from all causes or from specific disease,w14 w21 and reversal of the scale (a positive stress test was later reported as a negative stress testw19). For five trials, the inconsistency was major, as the components were not the same throughout the trial report.w7 w8 w16 w23 w24 For example, in one trial, death was added as a new component.w7 In another trial, about whether corticosteroids could be stopped early after renal transplantation,w23 the abstract concluded there was “no evidence of an increased risk of poorer performance” (based on 1 v 0 severe acute rejections). But, using the definition in the methods and data in a table, we found an increased risk of rejection (14 v 6 acute rejections, P=0.06). In a third trialw16 the results table omitted data for two components, sudden death and newly developed exertional angina, while the table provided data for an outcome not mentioned in the definition of the composite, stable angina. In two cardiovascular trials, data on the most important component were missing. 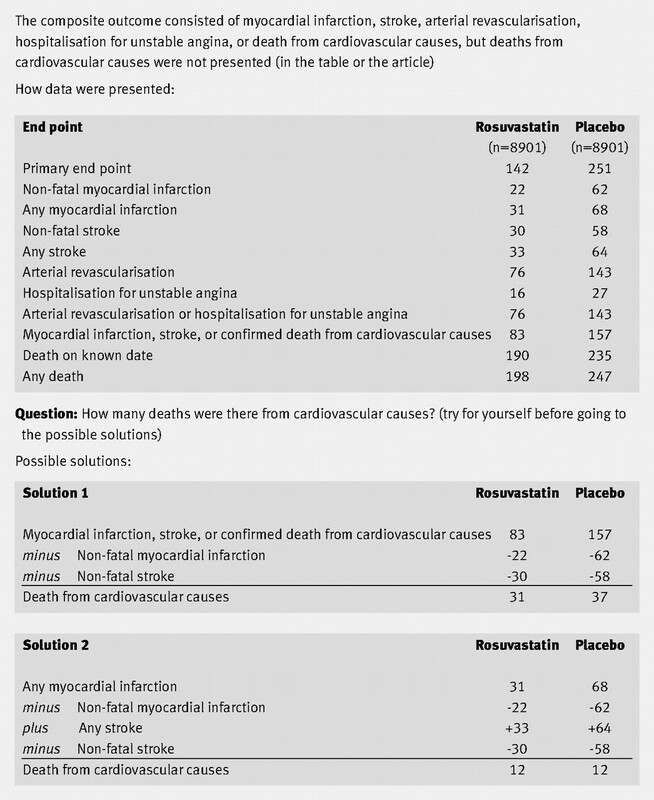 In one,w14 two of us tried to calculate deaths from cardiovascular causes from the categories presented in a table, but we arrived at two different answers and cannot determine which set of numbers, if either, is correct (fig 2⇓). The other trial provided a table with all the components,w7 but, as noted in the trial report, only those events that occurred first were tabulated. It was therefore not possible to see how many patients died, as only those deaths that occurred before any other events (such as gastrointestinal, eye, or skin complications) were reported. Consistent with problems about how clinical trials are reported in general,10 we found errors in the P values reported. One of the trials reported the composite was statistically significant (P=0.037)w15 when it was not (P=0.09 according to our calculation). In another trial, there was an error in the opposite direction: the authors reported that the most important outcome was not significant (P=0.192)w33 when in fact it was; the intervention was harmful, as it increased mortality significantly (P=0.046, our calculation). Confidence intervals for the components were not reported in 22 trials (55%). In 22 cases (55%), the conclusions of the abstract or the discussion did not remind readers that the outcome was a composite, and 33 conclusions (82%) did not specifically say if there was—or was not—a similar effect on the most important component (see examples in fig 3⇓). Statistically significant results were reported in three trials for the most important component (death or cardiovascular death), in one trial for both the most important component and the composite outcome (but in opposite directions, as the effect was beneficial for the composite of death or non-fatal myocardial infarction and harmful for deathw12), and in 16 trials for the composite outcome only. 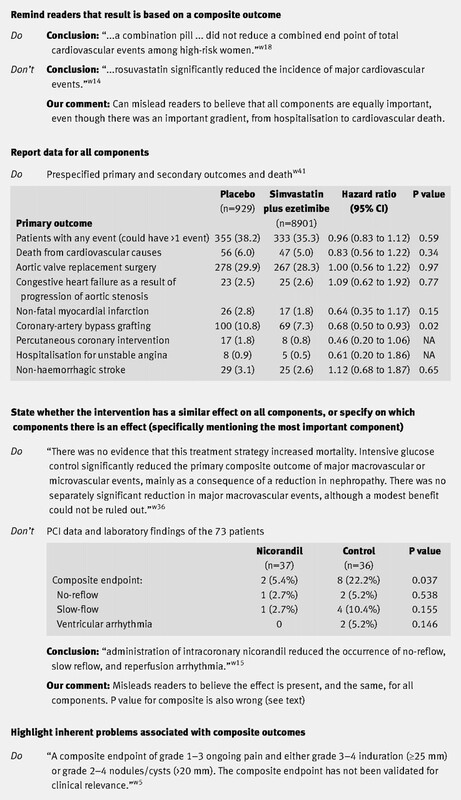 In 11 of these 16 trials, the abstract conclusions falsely implied the effect applied also to the most important component: two listed all components of the composite using “and” (see webtable 3 on bmj.com), and nine referred to the composite as a class of events (for example, “reduced the incidence of major cardiovascular events”w14). Trials with composite outcomes are often problematic, characterised by a lack of logic behind the construction of the composites, inconsistent and unclear reporting, post hoc changes to the composites, and cherry picking of favourable outcomes or combinations of outcomes. Guidance for authors aimed at ensuring that the components are appropriate and avoid misleading results and statements1 3 5 6 7 8 9 have existed for years but seem to have had little effect on the trials we examined, which were from 2008. Because components can be combined in so many ways, it is easy to find significant results. In one of the trials we included,w16 the composite consisted of eight cardiovascular end points, but there were also secondary composites that consisted of “combinations of primary end points as well as death from any cause.” These combinations were not specified, but nine end points can be combined, as two or more components, in 502 possible ways (29−1(empty sample)−9(samples with only one component)). The result for the composite was not statistically significant, but the abstract noted that the hazard ratio was 0.10 for a combined end point of fatal coronary events and fatal cerebrovascular events (P=0.0037)—that is, a cherry picked result. One would expect 25 of 502 possible combinations to be significant purely by chance. We also encountered the most ingenious way of getting rid of dead patients that we have ever seen.w7 Deaths in a cardiovascular trial were listed only if they occurred before anything else. Thus, one might avoid deaths by including a component that precedes death, such as chest pain. It is also problematic that death was so commonly included in composites, as it provides the lowest event rates and the smallest treatment effects.5 Furthermore, death can mean many things. It was total mortality in seven trials, some form of cardiovascular mortality in 17 trials, death with no further specification in seven trials, and sudden death in one trial. Since total mortality is the only mortality outcome that is guaranteed free from bias, we suggest that cardiovascular trialists use this outcome. A particularly revealing example of data dredging is the Anturane reinfarction trial.12 After publication of positive results, researchers at the US Food and Drug Administration found that the trial’s classification of cause of death was “hopelessly unreliable.”13 Cardiac deaths were classified into three groups—sudden deaths, myocardial infarction, or other cardiac event—and nearly all the errors in assigning cause of death favoured the conclusion that sulfinpyrazone decreased sudden death, the major finding of the trial. As we aimed at providing a general picture of the use of composite outcomes, we included all clinical areas. Because we relied on electronic searches, it is possible that hand searching journal articles would have yielded more trials. Most of the trials we identified were on cardiovascular topics, which is partly because composites are so common in this area and partly because all terms in our search strategy contained either “composite” or “combined” (see webtable 1 on bmj.com). For some diseases, composites may not be described as such. In cancer trials, for example, it is common to use disease-free survival, which means that the patients neither had tumour recurrence nor died. Such composites can be misleading, as some treatments reduce the risk of tumour recurrence while increasing the risk of death—for example, radiotherapy given to low risk patients such as women who had their breast cancer detected at screening.14 Another example is HIV infection, where it is common to use a composite of death or time to first AIDS defining event. It would therefore be interesting to perform studies of composite outcomes in other disease areas. We had planned to estimate an average “inflation” factor, comparing the effect for the composite with that for the most clinically important outcome, but it is not straightforward how one should analyse the data.8 15 The observations are not independent, as the most important outcome contributes to the composite, and ratios between relative risks are very unstable when the denominator is close to zero (division almost by zero).15 It is therefore not feasible to compare results within trials before pooling in a meta-analysis. For trialists—Composite outcomes should generally be avoided, as their use leads to much confusion and bias. If composites are used, trialists should follow published guidance1 3 5 6 7 8 9: only combine components of similar clinical importance, take care to define them consistently throughout the paper, analyse the prespecified composite, and list results for all components (not just the first occurring events) in a table with confidence intervals. Ideally, to avoid flaws in reporting and misleading perceptions about treatment effects,9 every single combination of events should be shown in a table. Thus, for five components, there would need to be 31 (25−1) lines in the table of outcomes. For meta-analysts—Meta-analysts should be careful when extracting data from trial reports with composite outcomes. We found many possibilities for data extraction errors—for example, subtle differences in wording may mean that what is being reported might not be what the meta-analyst thinks it means, or what was described in the methods section or elsewhere in the paper. Furthermore, it can be only those events that occurred first that are tabulated. Meta-analysis of composite outcomes is inappropriate, as the likelihood of cherry picking is too high; only the components should be used. For editors—Composite outcomes are easily misunderstood by readers. Editors should insist that conclusions explicitly remind readers that the result is based on a composite outcome. To avoid misleading readers, editors should ensure that conclusions state whether the intervention had a similar effect on all components or specify on which components there was an effect, specifically mentioning the most important component (see fig 3⇑). Finally, as the potential for post hoc changes is so large, editors should post the trial protocol and the raw data on the journal’s website. The use of composite outcomes in trials is problematic. Components are often unreasonably combined, inconsistently defined, and inadequately reported. These problems will leave many readers confused, often with an exaggerated perception of how well interventions work. We thank Eric Lim and colleagues for supplying us with the included studies in their review of cardiovascular trials in an electronic format that helped us refine our search strategy. Contributors: PCG, LS, and SW conceived and designed the study; all authors contributed to extraction, analysis and interpretation of data and drafting of the manuscript; PCG, LS, are SW are guarantors. Data sharing: A full data set is available at www.cochrane.dk/research/data_archive/2010_2. These data may be used only for replication of the analyses published in this paper or for private study. Express written permission must be sought from the authors for any other data use. Ferreira-Gonzalez I, Permanyer-Miralda G, Busse JW, Bryant DM, Montori VM, Alonso-Coello P, et al. Methodologic discussions for using and interpreting composite endpoints are limited, but still identify major concerns. J Clin Epidemiol2007;60:651-7. Ross S. Composite outcomes in randomized clinical trials: arguments for and against. Am J Obstet gynecol2007;196:119e1-6. Freemantle N, Calvert M, Wood J, Eastaugh J, Griffin C. Composite outcomes in randomized trials: greater precision but with greater uncertainty? JAMA2003;289:2554-9. Tomlinson G, Detsky AS. Composite end points in randomized trials: there is no free lunch. JAMA2010;303:267-8. Ferreira-Gonzalez I, Permanyer-Miralda G, Domingo-Salvany A, Busse JW, Heels-Ansdell D, Montori VM, et al. Problems with use of composite end points in cardiovascular trials: systematic review of randomised controlled trials. BMJ2007;334:786. FDA. Guidelines for industry: patient/reported outcome measures: use in medical product development to support labelling claims: draft guidance. BMC Health and Quality of Life Outcomes2006;4:79. Montori VM, Permanyer-Miralda G, Ferreira-Gonzalez I, Busse JW, Pacheco-Huergo V, Bryant D, et al. Validity of composite end points in clinical trials. BMJ2005;330:594-6. Lim E, Brown A, Helmy A, Mussa S, Altman DG. Composite outcomes in cardiovascular research: a survey of randomized trials. Ann Intern Med2008;149:612-7. Lubsen J, Kirwan BA. Combined endpoints: can we use them? Stat Med2002;21:2959-70. Gøtzsche PC. Believability of relative risks and odds ratios in abstracts: cross-sectional study. BMJ2006;333:231-4. Chan A-W, Hróbjartsson A, Haahr MT, Gøtzsche PC, Altman DG. Empirical evidence for selective reporting of outcomes in randomized trials: comparison of protocols to published articles. JAMA2004;291:2457-65. Anturane Reinfarction Trial Research Group. Sulfinpyrazone in the prevention of sudden death after myocardial infarction. N Engl J Med1980;302:250-6. Temple R, Pledger GW. The FDA’s critique of the anturane reinfarction trial. N Engl J Med1980;303:1488-92. Early Breast Cancer Trialists’ Collaborative Group. Favourable and unfavourable effects on long-term survival of radiotherapy for early breast cancer: an overview of the randomised trials. Lancet2000;355:1757–70. Krogsbøll LT, Hróbjartsson A, Gøtzsche PC. 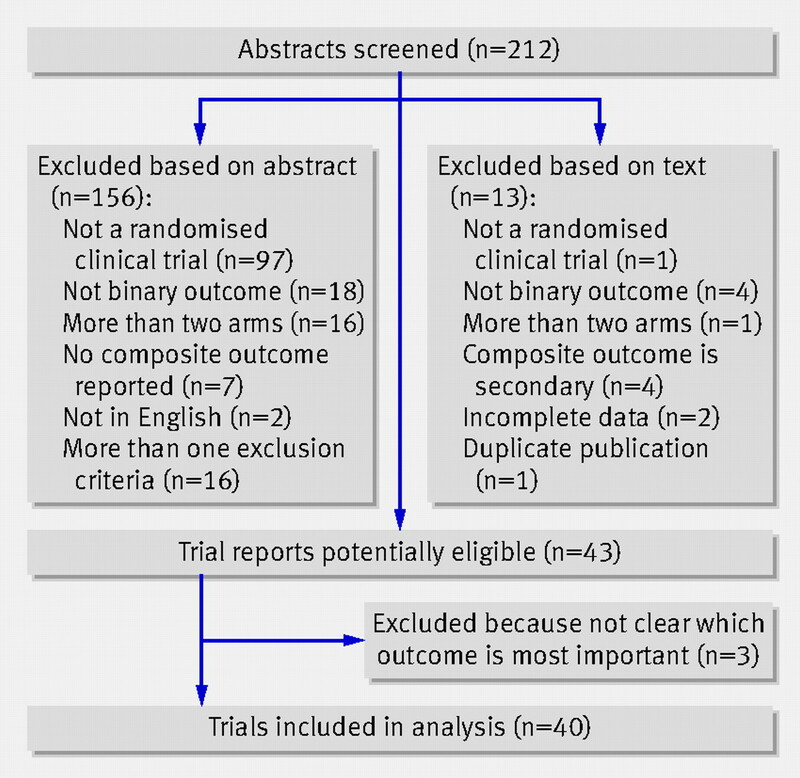 Spontaneous improvement in randomised clinical trials: meta-analysis of three-armed trials comparing no treatment, placebo and active intervention. BMC Med Res Methodol2009;9:1.